So guys, since I draw so much inspirato from the lovely blogs I read regularly, it seems almost hypocritical not to share those resources with you guys, too. Hence, a new feature. Check out the "fave blogs" links on the right side column (if you scroll down)- all of their writers are so amazing, and I am always finding new blogs that make me awed by people's creativity and thoughtfulness, and simultaneously, super jealous of their genius. I mean, it's just not fair. What's fun, though, if you have, like, a few days to kill, is to click on one of the blogs I like, and then click on one of the blogs they link to, and so on and so on for hours and hours. You'll be amazed at how much you'll learn. 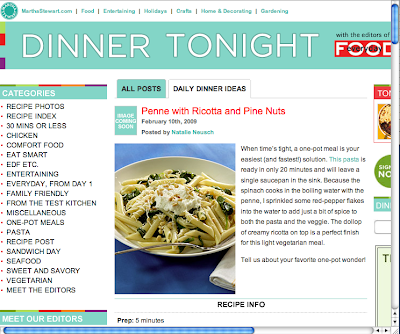 The first blog to which I'll direct your attention is Dinner Tonight, the blog by the authors of Martha Stewart's Everyday Food Magazine. Whenever I am totally out of ideas or intensely bored by everything I can think of to cook for dinner, I immediately go to this website. The recipes are all simple, made from easy-to-find ingredients (sometimes I don't even have to go shopping), and with easy to follow directions. And almost all of them can be made in under an hour. The editors post a new dinner recipe every day, so it'll keep things fresh for ya. If you are a fan of other blogs you think I might like, please let me know!